Shinken shobu, Aikido’s Great Battle….. 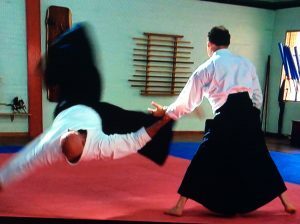 This paradox of training in Aikido is a difficult one. Over the years I have met all types of people that train for many different types of reasons. Health, spirituality, martial prowess or just to attempt to find that thing missing in their lives. We are told Aikido has two dimensions, spiritual and physical. 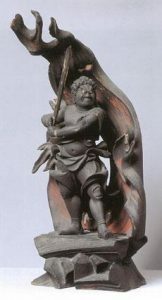 Just as studying religion or theology implies the study of a higher power or deity, so to the study of budo or a martial art implies the accumulation of the knowledge on how to fight or defend oneself. What are you studying and teaching, a religious philosophy, or a martial art? The practice of one degrades the art to little more than a synchronised dance, beautiful but martially ineffective. It implies a higher level of spiritual awakening exists without physical adversity as a precursor to this realisation. It becomes “intellectualised spiritualism”, as though a destination can be arrived at before a journey has begun….. The second puts the study of the martial aspect above the philosophical. Learning practical application for defence purposes and physical responses to aggressive encounters as the correct martial journey. But my question is do these two paths need to be exclusive of the other? In most people’s approach, these two training methodologies cannot be taught as a cohesive co dependant theology. The pacifist and the warrior struggle to coexist in a world whose history has hoped for one, but always relied on the other. Paradox indeed……. In my personal journey, I didn’t get into Aikido for philosophical reasons, I wanted to study budo. I went to Japan because of the flowery training that I perceived in the majority of practitioners within my own country. This is not every person’s journey, but my own. The path to understanding the philosophy of Aikido didn’t came through preconceived ideology on the subject of love, peace and harmony or any random (and rather egocentric) idea that my actions or thoughts would influence an entire world, but rather through the training of the body, and a lot of hard won introspection. Spiritual awakening through physical adversity, if you like…. The journey is fraught with difficulty, and it is impossible to pass on your personal sparks of wisdom along your journey, what I would like to ask though is, has your path been filled with honesty and sincerity? 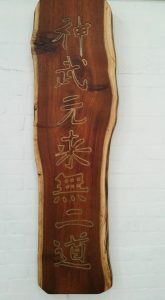 Sunao-the Japanese term for these English words is integral to the study of budo. Have we been honest and sincere in the way we have trained and studied or the reasons why? Or have we allowed preconceived notions that come from ego to distort our reality about what we are doing in the dojo? Have we become zealots or acolytes whose vision is clouded by our own ideology? Most that know me understand how I feel in regards to indoctrination, how it stifles the mind and traps the spirit. Any path that can offer(or at least pretend to)a way to spiritual growth, also gives us the potential for creating a trap for the very thing it professes to set free – the spirit. Love, peace and harmony are great virtues. Actually, the highest level of aspiration for human development I believe is benevolence, but the journey to this destination, if we tread along the path of Budo, must be Shinken shobu – training in dead earnest. A constant battle to the death between the ego self and the true self. Every moment a chance at introspection, every moment a look into the self, into the basic practices that define the art, firstly as it was intended – as a martial practice that, through the process of overcoming these preconceived ideas transforms the heart of the person in the conflict. Understanding death and rebirth, facing fears and overcoming, facing prejudice and overcoming, facing adversity and overcoming, facing the self and overcoming, facing egotistical ideas and overcoming. Shoshin is the mind of the beginner. It is the very essence of the study of budo. It is ever the mind of the student, open to change, willing to listen, humble and inquisitive. The journey is within, the struggles personal and the destination unknown. Teaching others is one of life’s greatest privileges. Learning to teach the self one of life’s greatest victories. This truth is found on the mat, if we allow ourselves to be challenged enough find it. This is Tanren, within the heart of the forge is the greatest heat. But for one to be tempered one first has to allow the process to happen. Metamorphosis is Tanren, and implies change through heat and pressure. Change can only materialise if we believe change is necessary. Surrendering our beliefs to the flames creates freedom. This was the wish of the founder, That training in the art of Aikido replaces the need for other forms of spiritual purification, when done correctly Aikido becomes this very ritual, Misogi Harai, a spiritual cleansing, through hard martial practice, and lots of ukemi. Our own self righteousness doesn’t allow this change, it prevents it. Surrender to the flames of the forge……….